Although the brisk morning breeze slowed us down, we were in good spirits. We were also making good progress. A handful of gray clouds dot the sky, but the sunlight still broke through, clothing the horizon and Lake Coeurd’Alene in a purple glow. 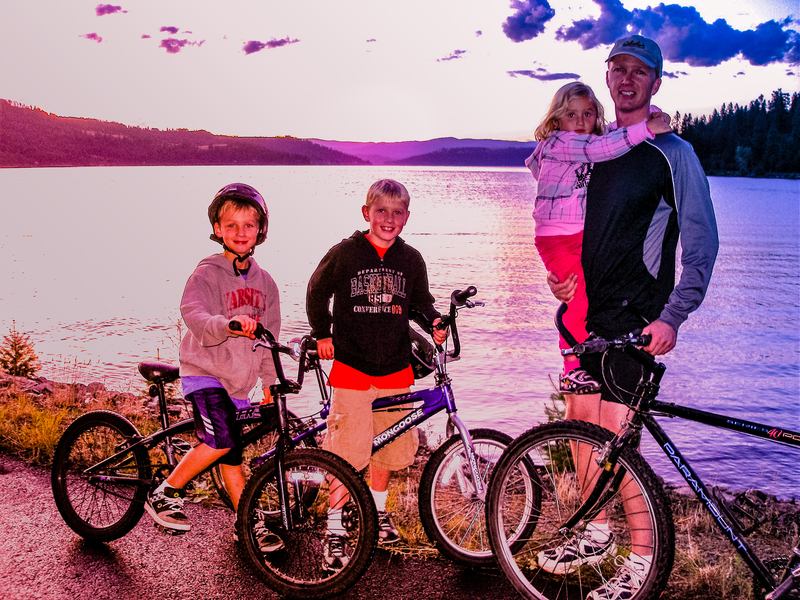 My husband and three young kids bike in silence as we soak in the beauty of our surroundings, listen to the birds sing, and inhale the fresh mountain air. But within 30 minutes our landscape darkens and the wind picks up as the small cloud fists consolidate into a giant thunderhead. My husband and I give each other knowing looks as the monster cloud sheds a few tears. We’re going to get caught in a freezing downpour while riding all the way back to the truck! After driving this far, the two-and-a-half-hour trip home—drenched to the bone—would be the ultimate spoiler. But just before turning around, we spot some sort of covering up ahead beside the bike trail. Yes! “Hurry!” My husband motions. One by one, before the giant cloud head unleashes his fury, we shelter under a small metal overhang. The breeze even dries our slightly damp clothes during the five minute rain stampede, drenching everything except us. Wow, thank you Lord, for guiding us here at just the right moment. Thank you for providing this covering. On Easter, we celebrated Jesus conquering death and sin through His resurrection after laying His life down on the cross as the sacrificial substitute for our sins. Similar to my family’s shelter from the rain, Jesus becomes our shelter, but on a much grander scale. Through the shedding of His blood, Jesus provides a covering from the damning consequence of our sin (death). “You see, at just the right time, when we were still powerless, Christ died for the ungodly,” (Romans 5:6). The disciple Peter wrote in 1 Peter 1:18-19, “For you know that God paid a ransom to save you from the empty life you inherited from your ancestors. And the ransom he paid was not mere gold or silver. He paid for you with the precious lifeblood of Christ, the sinless, spotless Lamb of God.” Jesus Christ’s blood is the most precious thing God has offered us. Not only is it the foundation of redemption, but also the only acceptable payment for our sins. Because we have all failed to obey God’s laws and are guilty of doing wrong (Rom. 3:23), we are separated from the holy God. The penalty of our sin is death (Rom. 6:23). Compared to God “all our righteous acts are like filthy rags” (Is. 64:6). Jesus alone is qualified to bridge the chasm between us and God due to our sin. His offer of salvation and fellowship is a free gift that we receive in Christ through faith (Eph. 2:8-9). In the Old Testament, after Adam and Eve’s original sin, God accepted the death of an animal as a substitute for the sinner since one life had to be given for another. This, however, was a temporary covenant. The blood needed to be repeated daily and yearly. While blood symbolized death, it also showed that a life was spared. God would later send His only Son providing a new covenant, or New Testament through Jesus Christ. Jesus’ death would be in the place of all sinners. His sacrifice completely fulfilled what the Old Testament covenant meant to. His blood would remove the world’s sins for everyone who puts their faith in Him. This sacrifice—an eternal covenant— would never have to be repeated. It’s the only provision, God sacrificing His Son Jesus in our place, that we acquire complete forgiveness. It is attained by accepting Jesus as our Savior, and accepting that He shed His blood to cover the sins of all who repent. John the Baptist called Jesus the “Lamb of God, who takes away the sins of the world” (John 1:29). The Lamb references the unblemished animal sacrifice from the Old Testament. Although there are numerous references to the sacrificial system in the Old Testament, a more familiar one is the sprinkling of blood on the Hebrew doorposts as they were in captive to slavery by the Egyptian Pharaoh. This act of obedience sealed God’s protective covering when His punishment of the death angel passed through the streets. This was just one curse that God sent down on Pharaoh because he refused to release these Hebrew slaves. The Hebrew Feast of Passover commemorates this event, which is now recognized as a “type” or foreshadowing of the blood of Jesus. The blood is a protective provision from God—powerful and freeing. If you have asked Jesus to be Lord of your life, then you too are covered by the blood of the Lamb on the doorposts of your heart. He covers your heart and your life with his protection from eternal death and with ever-lasting forgiveness of sin.